As you know, on Tuesday VMware announced the details of vSphere 5, complete with a new license model. As you know, on Tuesday VMware announced the details of vSphere 5, complete with a new license model. Yesterday we shared our full analysis of what the new licensing meant for VDI users, with the general feeling that vSphere 5 would be much more expensive than previous versions. In fact vSphere 5 looked like it would be so expensive for VDI that we wondered whether they would release a special lower-priced license for that use case. And in fact they did! After we published the story yesterday, VMware announced that they would create a specially-priced version of vSphere that you can use to host VDI desktops. Called "vSphere Desktop," this package will be functionality identical to vSphere, but you'll only be allowed to use it to run VMs running desktop OSes. Unlike regular vSphere 5 licenses which are based on the total number of physical processors and allocated memory across your entire vSphere environment, the VMware Desktop license is much, much simpler: You pay $6500 per 100 concurrent desktops running on your vSphere. You can have as many processors, cores, memory, and physical servers as you want. So this got a lot of people thinking. Is this new vSphere Desktop actually going to be cheaper than running your desktop VMs on vSphere with regular licenses? That's what I decided to find out. Before we get into the analysis, let's first take a look at a few important aspects of vSphere Desktop. First, VMware has always bundled something like vSphere Desktop into their VMware View product. (In other words, if you buy 100 seats of VMware View, you're allowed to use vSphere for those 100 View seats.) So technically you could say that this vSphere Desktop license isn't new, but what's new is that you can buy it standalone outside of View. This is important for customers who use other VDI products (like Citrix XenDesktop or Quest vWorkspace) who prefer to use vSphere for the hypervisor instead of XenServer or Hyper-V. It also means that this whole conversation about "Is vSphere Desktop worth it?" does NOT apply to VMware View customers. Finally, remember from yesterday that the vSphere Desktop product has the same functionality of vSphere Enterprise Plus (the highest edition). So instead of saying you're buying vSphere Desktop, you could say that you get a special price of $6500 per 100 VMs for vSphere 5 Enterprise Plus as long as your VMs run desktop OSes. So now that you understand the basics, let's dig into the data. 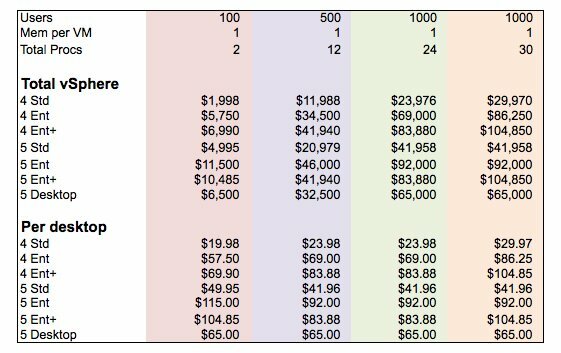 Yesterday I published an Excel-based cost calculator that you can use to calculate the vSphere pricing for various VDI scenarios. I used it to look at pricing for VDI desktops running with 1GB, 1.5GB, and 2GB of memory each. The chart below shows four different scenarios based on different combinations of users and total processors in your VDI environment. In this particular chart, every scenario is based on the desktop VMs each having 1GB of RAM. 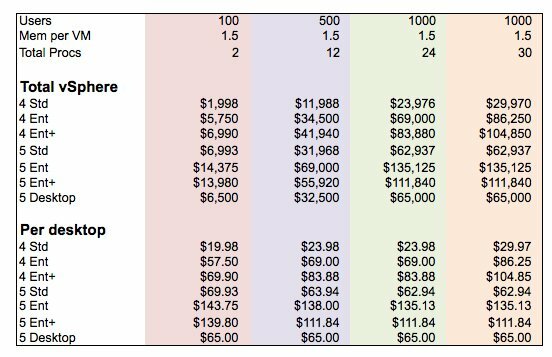 The "Total vSphere" section of the chart shows the overall vSphere license cost for that particular scenario, and the "Per desktop" price shows the vSphere licensing costs per desktop. With 1GB of RAM per desktop VM, we see that vSphere 5 is more expensive across the board. This chart shows a few different scenarios all with 1GB of RAM. 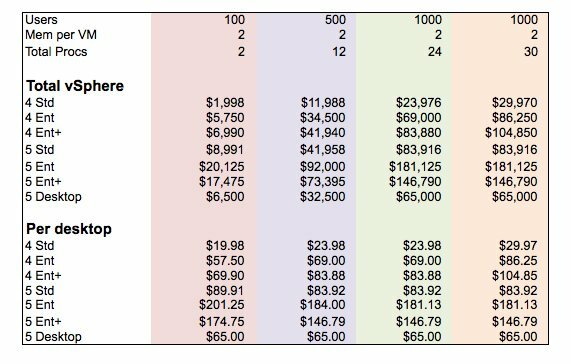 We can see that if you're using the Standard Edition of vSphere, moving from 4 to 5 is going to be more expensive no matter how you slice it. But if you want to use the Enterprise or Enterprise Plus edition of vSphere, it looks like you'd be better off just going for the Desktop edition. Now let's move up to 1.5GB of memory per desktop VM. Since vSphere 5 licensing is so heavily memory-based, adding 50% more memory per desktop versus the previous chart means that even the vSphere 5 Standard edition pricing is just about on-par with the desktop pricing. So if you're in this scenario, you might as well buy the vSphere Desktop so you can get the Enterprise Plus features and the predictable pricing. Once we get up to 2GB (or more) of RAM per desktop VM, we see that no matter how you slice it, you're better off just buying the vSphere Desktop. So it comes down to memory. If you have extra small desktop VMs (1GB RAM each) and you want to use the Standard Edition of vSphere, you might get away with buying the regular Standard Edition. But for every other scenario, it looks like vSphere Desktop is the way to go. Therefore I feel pretty good making my official recommendation, "Yes, if you want to run your non-View VDI product on vSphere, you should buy the vSphere Desktop edition." It appears that existing VDI customers might not be so happy. Remember that the vSphere Desktop license is only available for new licenses purchased. (I'll bet you're glad you didn't rush to VDI now, eh?) If you have existing vSphere licenses, you can only convert them to the equivalent regular vSphere license. This might be a problem, though, because the old licenses were just based on processor while the new licenses are based on processor and memory. For example, imagine you have a dual-processor server with 192GB RAM to serve 100 VDI sessions. In vSphere 4, you needed two processor licenses. But in vSphere 5, you also need to ensure that you have enough licenses to entitle you to use all that memory. So even if you bought the Enterprise Plus licenses which give you rights to 48GB RAM each, you need four of those now instead of two. In other words, your cost would double. In this case it would be much cheaper to move to the vSphere Desktop, but of course you can't do that. Soo...???? Vsphere 5 will surely be a huge hit, just like all other Vmware products. This will definitely strengthen their position as the market leader. @thevmguy - Yeah, I think Brian was talking about non-View situations where you can't upgrade to vSphere Desktop from vSphere 4, even if you're only using it for VDI. We'll edit the article to remind people of that, though. Thanks for pointing it out. vSphere Desktop with unlimited vRAM entitlement," but I read that as "View comes with vSphere Desktop now"
So, looks like we need some official clarification. What you say would make a lot of sense, but I definitely don't get that from the FAQ. I think mattyb is a VMware marketing robot. Yes, exactly. I tried to point out up top that this whole article only applies for people who aren't using View, but I'll clarify that. So my assumption is that when View 5 comes out, View 4 customers who are entitled to upgrade will get the vSphere 5 Desktop licenses too. Even if I do not appreciate this move from VMWare, there is still 2 points that always come to my mind when there is a price discussion : price versus services ratio. The price is based on the entire product feature set and capabilities, not the only feature you would like to get) and therefore could appear to be expensive upfront if you do not need the value from this product (and we can take as an example Citrix MetaFrame/Presentation Server/XenApp that always had an expensive 1st impression but, for me, justified by the value it provided). Of course, each time the license model change (not the price by itself), you need to redo the calculation of your Price/Services ratio. There is other alternatives on the market with different prices and values (and different ratio cost versus services) you can considered (Hyper-V, XenServer or KVM just popped up in my mind). There is still a cost associated with this migration phase that need to be included in the price/services ratio. Summary : if you do not like this announcement, make a product change (or make a successful pression on the supplier). If you're locked in with this product, definitely time for a big product and infrastructure change to a more open solution. It will hurt but will build a more quite future. Does anyone know if these means that if I have View today...I could at a future date downgrade to the "vSphere Desktop" if we wanted to switch to a competing product such as XenDesktop or vWorkspace? I bet this new licensing model will make Microsoft very happy.